Adagio is a clean and easy to use WordPress theme created to showcase your work with style. Professional design combined with easy to use features will make your website stand out from the crowd in no time. Using also the JetPack plugin it will offer you a set of powerful features. Doesn’t matter what your visitor’s device is, Adagio is optimized to display great on desktop and mobile. With a fluid layout and latest coding techniques the user’s experience will be flawless. Besides being attractive, Adagio’s home page offer also a great flexibility with its optional layouts. Below the full screen image you can display a set of featured posts or pages, your latest blog entries, a static page or your portfolio. 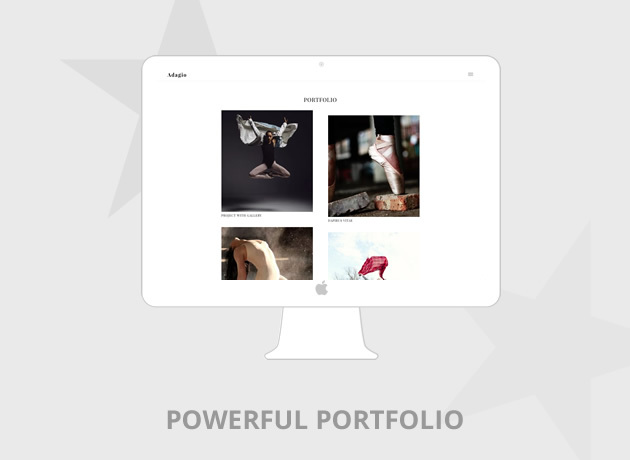 Using the powerful Portfolios from the JetPack plugin, with Adagio will be extremely easy to showcase your work in an attractive way. Add links to your Social media accounts easily with the integrated Social Media menu. Blanche comes loaded with 28 social media icons to have your visitors connect to you. Adagio comes with three widget ready locations to help you add some extra info and functionality to your website. Child theme is the recommended way to modify your theme. Adagio enables you to create and activate a child theme with just one click.